The first version of this month’s column never saw the light of day. You see, I was going to follow the trends and make October the official Pumpkin Spiced Great Plates Month. Unfortunately, I struggled greatly while writing that version because I have a confession to make: I don’t like pumpkin spice…anything. To be fair, I seriously love pumpkin, but every recipe for every seasonal pumpkin thing out there has ginger, a delicious spicy root that I happen to be highly allergic to. With that in mind, this month I am bringing you a couple of my favorite recipes for classic, old-fashioned treats that just might take your mind off the fact that neither is pumpkin spiced somethingorother. Apple butter has been around since the Middle Ages, when monks in Belgium and Germany came up with a way to preserve the tremendous number of apples their orchards were producing. When I was growing up, my decidedly Southern breakfast table would never have been the same without big, steaming hot biscuits slathered generously with homemade apple butter. My recipe is super-simplified thanks to my trusty slow cooker, and if you decide to double the batch, it can be canned for easy storage and well-appreciated holiday gifts. The evening meals were equally delicious, of course, but as kids we thought the real entrées were the thick slabs of banana nut bread we were treated to for dessert. It has been an American staple since the 1930s, when the use of baking soda and baking powder first became popular, and it is one of the easiest dessert breads to make! It doesn’t get any easier than homemade apple butter, especially when you use a slow cooker. As a rule, I like to start a batch of apple butter in the late evening, and let it work its magic in the slow cooker overnight. If it still isn’t thick enough by morning, I can then set the slow cooker to warm and allow it to continue to work throughout the day without worrying about scorching the tasty apple butter. Peel, core, and thinly slice the apples. A mandoline slicer will make easy work of it, and your slices will cook much better if they’re perfectly even. ?NOTE: If you aren’t using any Granny Smith apples, adding a tablespoon of apple cider vinegar to the slow cooker will cut through the sweetness and give your finished butter just the right amount of tartness. Pack the apples in the slow cooker (it’s OK if they fill it completely). Sprinkle remaining ingredients evenly over the apples and cover, leaving a small gap for moisture to escape. Set the slow cooker to low heat and allow to cook for 8-10 hours. Stir and check thickness. You will find that the apples have broken down completely, and you may be able to use a whisk. Continue to cook if needed until the desired consistency is reached, or use a stick blender to get a smoother consistency. PRO TIP: Not in the mood for apple butter? You can use the same recipe to make equally delicious pear butter! 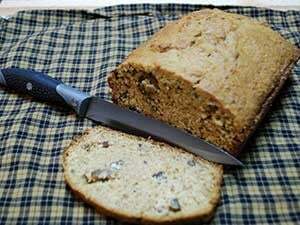 Of all of the sweets I was treated to growing up, there is none I remember so fondly as my Granny’s banana nut bread. It was never prepared for a special occasion, but it always seemed to show up when nothing else would do. If you were lucky enough to be around when it had cooled, you were all but guaranteed to get the highly sought after end piece. We never devoured this precious bread, instead breaking off bites and savoring each one. Did You Know: February 23 is National Banana Bread Day! There are endless possibilities for changing this recipe, from using different nuts to mixing the fruit, but I am such a huge fan of the original that I rarely stray very far from what I had when I was young. If you are in the mood to change it up though, try replacing one of the bananas with some crushed pineapple for a shockingly tasty play on a pineapple upside-down cake. Preheat the oven to 325 degrees. Grease and flour a loaf pan, or use cooking spray. In a mixing bowl, combine butter, sugar and bananas and mix completely. 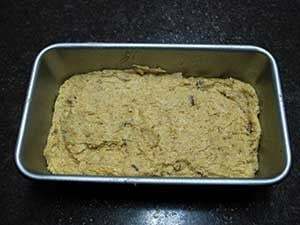 Pour into loaf pan and bake for 75 minutes, or until a toothpick comes out clean when inserted into the center of the loaf. Allow bread to cool for 15 minutes, and then remove it from the pan to a wire rack. Allow it to cool for at least half an hour before serving. Pro Tip: Want to reduce the sugar? Use half a cup of sugar, and half a cup of applesauce! Don’t forget that doubling these recipes will give you extra yummies to share. Giving away food that you made yourself is a time-honored tradition that not only endears you to your friends and loved ones, but also makes them wonder how and when you became such an amazing cook. Of course you could share the recipes with them, but you can’t give away all of your secrets, now can you? I hope you and yours have a beautiful October, enjoying the changing of the seasons with those you love. Until then, eat well and never miss an opportunity to smile! Michael Nolan is a professional gardener and food writer based in Atlanta. His digital cookbook, “Food Camp: Kitchen Survival Skills,” is available on Amazon.com or through his website, MyEarthGarden.com. Great article, always looking for some old and delicious recipes. I made 3 different types of banana bread last year. Banana nut, banana chocolate chip, and plain banana bread. 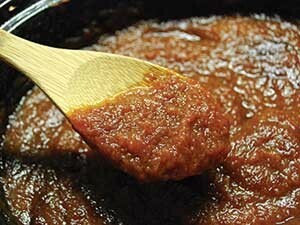 This year I will try your recipe and that apple butter sounds great on some waffles or toast. Thanks for sharing.